Designed for industrial applications, each step produces accurate, parallel holes with a small clearance on the nominal diameter. The maximum material thickness is determined by the length of step (If the work piece can be reversed multiply thickness by 2). For use in industrial power tools or pedestal drilling machines. 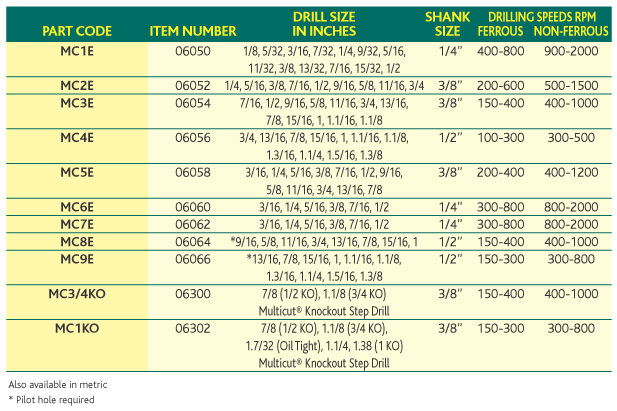 The most comprehensive range of Drills for all applications. Below is listed our current standard stock range - please enquire for other sizes. 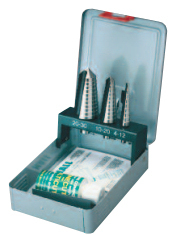 When drilling metals always use cutting compound - available in 30cc, 60cc and 1/2 kilo sizes. Metal cassette containing Multicut tools and 30cc pot of special cutting compound. Helps maintain the sharpness of the cutting edge. Lubricity reduces torque and prevents undesirable material build up on the tool. Suitable for other metal cutting operations - thread cutting, normal drilling. ALWAYS USE WHEN DRILLING METALS.